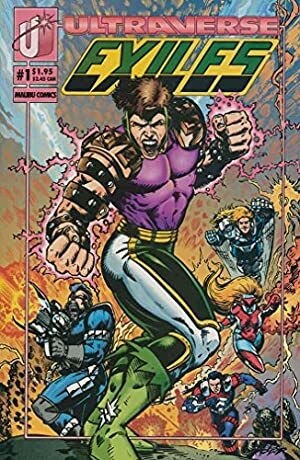 The Ultraverse was a super-hero setting and comic books line launched by Malibu Comics in 1993. The Exiles were an early part of it, with a peculiar storyline. For context, you should first read the profile for Dr. Rachel Deming, which has the info about the team’s history. Known Relatives: Unammed parents, an unnamed older brother, an unnamed older sister. Base Of Operations: Stronghold (an island off the Californian coast). Tinsel’s body absorbs light, and can regurgitate it as plasma blasts. The blasts are primarily concussive force, but can be tweaked to emit most their energy as blinding light. Beyond shooting at things, Tinsel can release unfocused blinding light from her entire body. Scott can also direct concussive blasts against the ground, to propel herself into the air. Some scenes give the impression that she has a full power of flight. However, authorial intent and later scenes confirm that it’s closer to super-jumps. Light actually feeds Tinsel. She needs very little conventional food as long as she gets good exposure to sunlight and artificial lighting. Being plunged in darkness will deplete her energy reserves. This will weaken her powers and eventually leave her powerless and starving due to lack of light. The Theta mutations made Tinsel’s retinas useless. Presumably Dr. Deming’s counter-measures couldn’t stop this damage in time. Scott is thus blind. But Deming built a visor for her that simulates sight and feeds information to her optic nerves. Tinsel can operate just like a sighted person as long as she wears her visor. What the world looks like through the visor is unrevealed. The visor is obviously super-technology. Thus, wearing it in her civilian identity would attract too much attention. 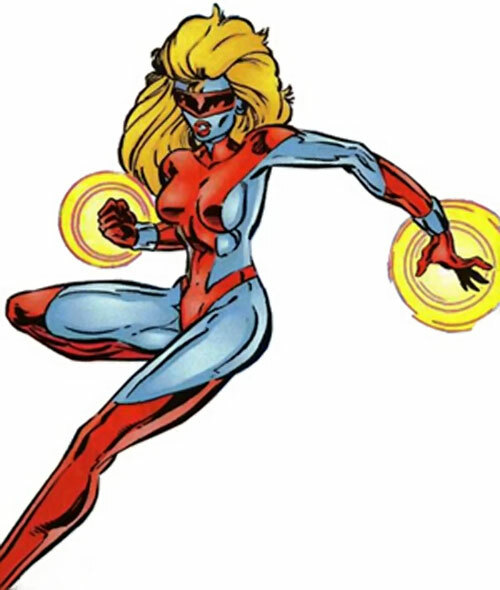 Since operating in her civilian identity results in a handicap, Tinsel is considered in DC Heroes RPG terms to have a Secret Identity, unlike the rest of the Exiles. Melissa is the youngest child of a couple of Berkeley hippies, who operate a bookstore near the campus. Her sister and brother have moved away from their parents’ lifestyle and values, but Melissa remains interested in expressing herself and making the world a better place. Her Theta Virus infection became active when she was 16. She was saved by the intervention of Dr. Deming but lost her sight despite Deming’s efforts. Melissa was considering going to college to study sociology or perhaps psychology. But she agreed to join the Exiles field team to help save lives and oppose ruthless business magnate Malcolm Kord. Throwing a 16-year-old into super-fights without training may not have been the best idea. During an assault of the Exiles on Kort’s base, Tinsel was captured and deprived of her visor. Kort handed over to mercenary Bloodbath as a reward. Tinsel was forced to permanently blind Bloodbath to defend herself. Bloodbath blindly gunned Tinsel down as she was trying to escape. He was soon murdered in turn by Tinsel’s colleague Ghoul. Ghoul then blew up most of Kort’s building in revenge for Tinsel’s death. This apparently killed Kort and his staff. Tinsel’s skin takes on a silvery, blue-ish, almost metallic tone whenever she uses her powers. The blue parts of her costume are the same colour than her altered skin’s, making it look like she’s wearing an impossibly skimpy swimsuit when she’s using her powers. Tinsel was well-meaning, courageous and an idealist. But she was just a kid, and a sheltered one. She liked the notion of fighting for a good cause and helping save lives, and thought that it was important to oppose Kort as a symbol of capitalism gone wrong. Scott was never taught by her parents to conceal her feelings, and wears her heart on her sleeve. She was generally naïve and soft, though she was also fairly intelligent and quite dedicated. All Powers are Contingent Upon Solar Sustenance. Flash can have an Explosive Radius, but it has no Range when used that way. Jumping has the Catfall bonus, but is likely to damage the surface whence Tinsel propels herself. SPR (Blind), Loss Vulnerability (prolonged lack of light diminishes her Solar Sustenance and from there all of her Powers), Secret Identity. Visor [BODY 04, Misc. : Compensates for her blindness]. SKYCYCLE [STR 04, BODY 05, Flying: 07, R#2]. – Rocket Blasts — Leaping 6, Quirk (likely to damage launch and landing surfaces). – Light Absorption — Feature (draws sustenance from exposure to light). Concussive Blast — Ranged Damage 6. Blinding Light — Visual Dazzle 6. Blinding Burst — Visual Dazzle 6, Area (Burst), Reduced Range. Athletics 3 (+4), Close Combat: Unarmed 4 (+7), Insight 2 (+3), Perception 3 (+4), Ranged Combat: Light Control 10 (+11), Vehicles (Limited 1, air and land) 4 (+5). Upholding the Good Tinsel helps others, even in the face of adversity. Conditionally Blind In her civilian identify, Tinsel is blind due to retinal damage caused by the Theta virus. 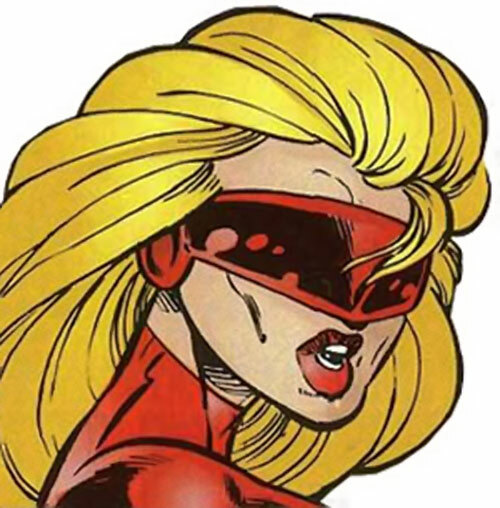 As Tinsel, she wears a super-science visor in her heroic identity that somehow allows her to see. If attacked directly, the visor has a TOU of 4. Power Loss Prolonged lack of light diminishes her Light Absorbtion and from there all of her Powers. Trade-off areas. Attack/Effect PL 9, Dodge/Toughness PL 6, Parry/Toughness PL 6, Fort/Will PL 5. Points total 77. Abilities 24, Defences 17, Skills 12, Powers 20, Devices 0, Advantages 6. Equiv. PL 6. Helper(s): M&M stats by Pawsplay.